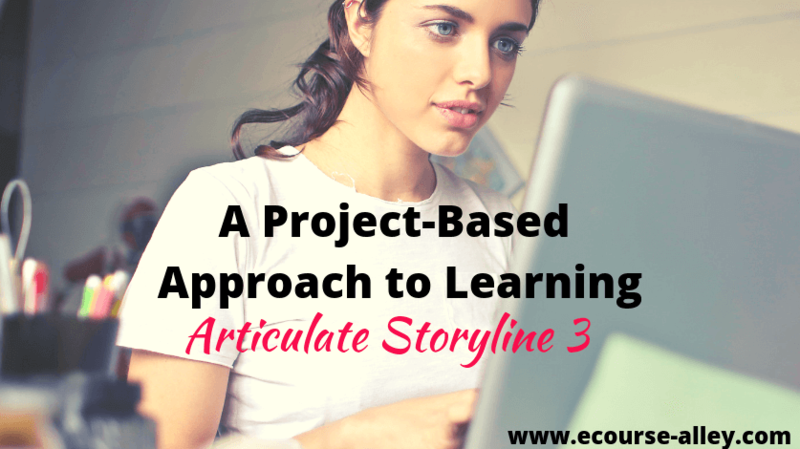 Today I wanted to share a bit about our journey to create a project-based approach to learning Articulate Storyline 3. We’ve been working on an online course entitled Learn Articulate Storyline 3 the Easy Way! which walks learners through step-by-step to create an entire example online course using Articulate Storyline 3 from scratch. So, in light of our recent online course going LIVE this week, I’ve structured this post as a series of FAQ questions, in case you are interested in learning more about it. As a gift to you for stopping by e-course alley, be sure to check out the end of this post, where you can grab a 94% off discount coupon for Learn Articulate Storyline 3 the Easy Way!. 1. WHAT IS ARTICULATE STORYLINE 3? Articulate Storyline 3 is an e-learning authoring tool software that is used by instructional designers/online course creators to develop online learning courses. 2. 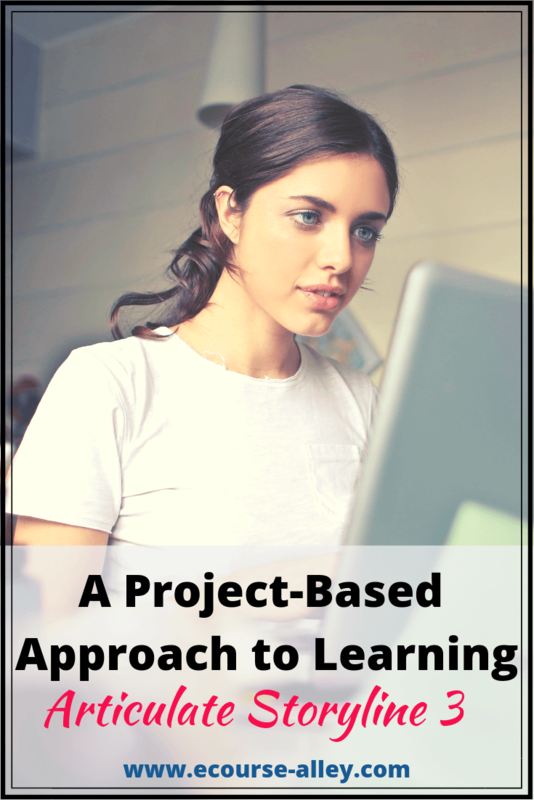 WHAT IS A PROJECT-BASED LEARNING APPROACH? A project-based learning approach places the student at the center of the learning initiative. Students or learners gain a deeper understanding of the content by working towards a goal in the form of a real-world project or problem. They actively “learn by doing” instead of learning by watching or listening, which is a more passive approach. 3. WHY DID WE TAKE A “LEARN BY DOING” APPROACH WITH OUR LATEST ONLINE COURSE? We believe that if you really want to learn something at a deeper level, you have to do it. So, we took this “learn by doing” or project-based approach with our course Learn Articulate Storyline 3 the Easy Way! because we wanted to have learners working towards a goal. As a result of this approach, at the end of the course learners will have a completed Articulate Storyline 3 project that they can refer back to when creating their own online courses. 4. WHAT IS OUR NEW COURSE ALL ABOUT? In this training, we create an Articulate Storyline 3 course using an example of something fairly straightforward that you could teach others. 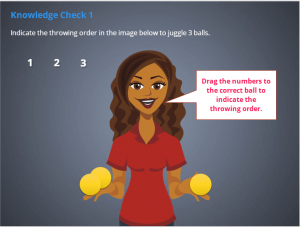 The topic I chose was learning how to juggle 3 balls. 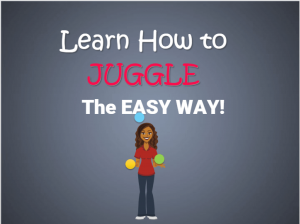 I decided to use this topic because juggling is something I learned about a while ago myself, so I knew something about it. I also chose this as our example course because there are only 5 steps involved, so I felt that it wouldn’t be too complicated to use as a demo course. If you’d like to learn more about Learn Articulate Storyline 3 the Easy Way!, then check out our promo video and this overview about what you will create when you enroll in this course. 5. HOW IS OUR COURSE STRUCTURED? Our new course is structured using step-by-step videos that you follow along at your own pace. You will also be using a storyboard that I provide to help guide you along the way, that I refer to in the videos. Since these videos are pre-recorded, you can play, rewind, and pause the videos at any time. This will help you learn this authoring tool by working toward building a short online course example of your own. If you are new to the concept of storyboarding, then check out this post where I explain how you too can create a blueprint for your next online course to help minimize rework, improve production efficiency, and streamline your course organization. Or, go directly to our Storyboard Your Way to E-Course Success online course which will give you an in-depth look at storyboarding as well as provide you with several free resources. 6. WHAT WILL I LEARN IN THIS COURSE? 7.	WHO IS THE TARGET AUDIENCE? 8. ARE THERE ANY PRE-REQUISITES TO TAKE THIS COURSE? Don’t worry if you are new to e-learning or instructional design, you can still enroll in this course. Actually, jumping right in and learning how to create courses using Articulate Storyline 3 is a great place to get started! If you are interested in learning how to use Articulate Storyline 3, then sign up for the Free Trial of Articulate Storyline 3 and grab this Discount Coupon for our latest course: Learn Articulate Storyline 3 the Easy Way! Leave a comment and let me know if you have any questions about Articulate Storyline 3 or about our latest online course.